The nails of the toes and fingers act as shields, protecting the tender skin lying underneath. They also add strength and increase sensation. 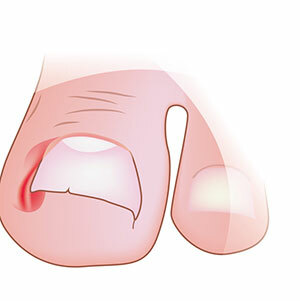 Nails are often damaged themselves and one of the most common examples of this is ingrowing toe nails. The nail - usually the big toe nail - grows into the skin down the sides of the nail, becoming embedded as the nail grows, which can cause it to weep or bleed. If it has a sharp edge (usually at the side) this digs into the flesh causing pain, irritation and possibly infection. The nail is tender to any pressure. Poor foot, toe, or nail structure, or a particular style of walking, excessive sweating, or direct injury, all contribute to this condition, but the most common cause is cutting the toe nails incorrectly. Nails cut too short, or down the sides, may leave a sharp piece of nail which pierces the groove as the nails grow. Tight footwear and hosiery can only make matters worse. You can help prevent the problem developing by keeping your feet clean with regular bathing. Dry them thoroughly, and apply a foot powder lightly. Wear clean cotton socks every day, and correctly-fitting shoes that allow the foot to 'breathe'. This is especially important for people whose feet sweat excessively. Cut your toe nails correctly with proper nail clippers. You should cut the nails to the shape of the end of the toe. If elderly or diabetic, you should seek professional advice regarding nail cutting. If your eyesight is poor or if you have difficulty cutting your nails, let one of our podiatrists help you. In the early stages - the first few days - if the toe is inflamed, bathe the foot in a warm saline footbath. Three tablespoonfuls of salt dissolved in a basin of warm water will help prevent infection and reduce inflammation. Don't cut the nail. Put on a clean dressing. The sooner the problem is dealt with, the easier it will be to treat effectively. Seek advice as quickly as possible, especially if you are diabetic or have some other long-term illness which requires special care. Treatment is relatively painless and can be carried out quickly in our Leicester clinic. We'll have you back on your feet again in no time! If there is no infection, your chiropodist will usually smooth the edge of the nail and remove any offending splinters. If the nail is infected or weeping, they can reduce the inflammation, and remove the splinter under local anaesthetic. They will cover the toe with a dressing and protect it with padding, applying appropriate medicaments which will reduce the infection. You will be able to walk straight away, though it is advisable to rest the foot as much as possible, and relieve any pressure on the toe. Cutting the toe nails properly and wearing correct footwear should stop the problem recurring. If the problem persists or is severe, your chiropodist will probably recommend that you have the side of the nail, and the nail bed, removed under local anaesthetic. This simple operation is painless, produces a good cosmetic effect, and the problem is not likely to recur. Sometimes the whole nail and nail bed is removed. The podiatrists at Absolute Health are experts at dealing with ingrowing toe nails and will use the latest nail surgery techniques.